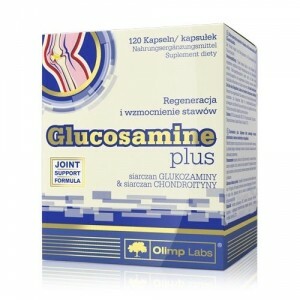 Olimp Glucosamine Plus - Food supplement, delivers additional glucosamine sulphate and chondroitin sulphate to yours food pattern - that contribute to the maintenance of normal structure of joints, tendons and bones, as well as help to keep healthy and flexible joints. Food supplement in capsules, containing glucosamine sulphate and chondroitin sulphate. Take one capsule two times a day with meals. It is recommended to use this formula for at least 6-8 weeks. Do not exceed the recommended daily dose.